The State Bank of India today swooped on loan defaulters and took the possession of three properties under various sections of SARFAESI Act, 2002, in different parts of the city today. The District Consumer Disputes Redressal Forum has penalised a pathologist for conducting a test negligently, which resulted in an erroneous test report leading to mental agony and harassment to a consumer. An NRI and a former Assistant Professor, Punjab Agricultural University, had purchased a plot seven years ago by paying around Rs 5 lakh to Vikas House Building Private Limited in instalments. One person was killed and three others, including a minor boy, were seriously injured when a tractor-trolley crashed into a road-side shop of a quack housed in a tent near the Jalandhar byepass chowk this early morning. 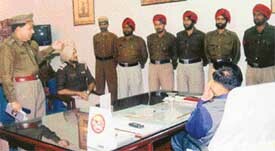 Deputy Inspector-General of Police, Ludhiana Range, Parag Jain today presented class-I commendation certificates to seven policemen of non-gazetted ranks along with appreciation letters to an SHO, and senior officers of the city police for successfully thwarting a bank robbery at Millerganj yesterday. All India Congress Committee secretary Manish Tewari today said that approval of much-awaited alignment of the four-laned Ludhiana ring road to be constructed at a cost of Rs 1,100 crore by the Punjab Infrastructure Development Board will prove to be a boon for city residents. The rise in the population of the city, notwithstanding, there is no proper public transport system. A few years ago, the district administration had mooted the idea of running mini buses on different routes. But the proposal never took off. Rtn S.P. Sethi, District Governor Rotary International, District 3070, inaugurated the multi district Rotary Youth Leadership Awards 2005, hosted by the Rotary Club (Ludhiana North-East) at Government College for Women here yesterday. The police claimed to have arrested two thieves red handed with stolen goods on Friday. Mr Rajeshwar Singh Sidhu, DSP, said cops deployed in community policing had arrested the thieves. The shopkeeper, from whose shop the goods were stolen, has honoured the cops with cash reward. A retired Inspector of Punjab Home Guards, reportedly committed suicide by shooting himself with his gun in his house at Dugri Urban Estate Phase-II this evening. Some of the colleges here are facing a tough situation as the university forms for annual examination are not readily available from the Panjab University, the last date of the submission of which has already been announced by the university. Three girl students from Guru Nanak Khalsa College for Women here who won the Inter-Zonal quiz competition at Ramgarhia Girls College on Wednesday, are now preparing the national title with great enthusiasm. The winning trio: Students of Guru Nanak Khalsa College for Women have been preparing for national quiz contest. — Photo by I.V. “Computer training for govt school teachers is being imparted at Govt Inservice Training Centre under ‘Microsoft Project Shiksha Scheme,” disclosed Mrs Sarabjeet Kaur, Principal, GITC, here today. The Punjab College of Technical Education started its 2nd international conference on ‘Challenges and Opportunities in IT Industry-ICCII 2005’ here today. A UGC-sponsored two-day national seminar organised by the postgraduate Department of Punjabi, Guru Nanak Girls College, concluded here today. The morning session was presided by Dr Atamjit Singh, Principal of Amardeep Singh Shergill Memorial College, Mukandpur. A workshop on HIV/AIDS was held under the aegis of NCC Gp HQ Ludhiana at Sacred Heart Convent School, Sarabha Nagar, here yesterday. Officers, associated NCC officers of various colleges and schools and NCC cadets from Ludhiana, Jalandhar, Amritsar and Patiala participated in the workshop. An inter-class quiz contest of students of vocational subjects of foreign trade practices and procedures was held at GGN Khalsa College here today. Six teams comprising students of BA I, II and III participated. Giridhar Gomang, former Chief Minister of Orissa, visited the SDP College for Women, Ludhiana, today. He was accompanied by Mr Balraj K. Bhasin, President, SDP Sabha and educational institutions. When Sadat Hasan Manto wrote ‘Toba Tek Singh’ to voice his anger against Partition, little did he know that his story would be re-enacted after about 60 years and that too on a happy note when 48 mentally challenged children from Pakistan joined their Indian counterparts to participate in the eighth edition of the Punjab Special Olympics-2005 here today. Special children from Pakistan take part in the Punjab Special Olympics in Ludhiana on Saturday. The annual athletic meet of Shri Guru Harkrishan Public School was organised here today. Ms Amrit Gurm, president, school managing committee was the chief guest. 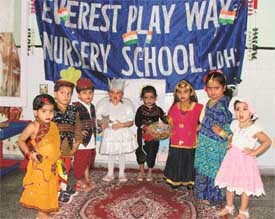 Immediately after march past, sports events were organised for various classes.